Tsubaki SMART TOOTH offers users the ability to identify and schedule drive system maintenance before critical component failure occurs. Strategic placement of our patented Wear Indicator pins on one or more sprocket teeth provides visual indication that a sprocket is still within the allowable wear tolerance, or that it needs to be replaced. When factoring in cost of critical drive system components, implementation of Tsubaki Wear Indicator technology makes sense for applications that are driven by capital equipment, or where non-scheduled downtime is simply not acceptable. 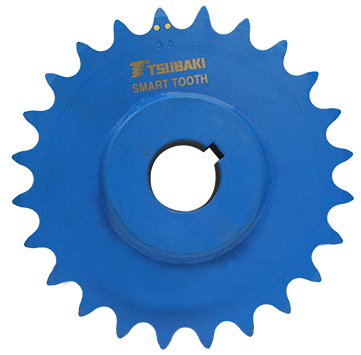 Over time in service, the sprocket tooth profile area is reduced due to induced load created by the chain roller. The reduction in sprocket tooth profile area creates accelerated wear on the drive chain roller, causing poor fit, alignment, and chain wrap as it relates to the tooth profile. Ultimately, chain wear accelerates at an exponential rate, resulting in loss of tension, jumped chain, drive slipping, and catastrophic failure. TSUBAKI SMART TOOTH IS YOUR SOLUTION!